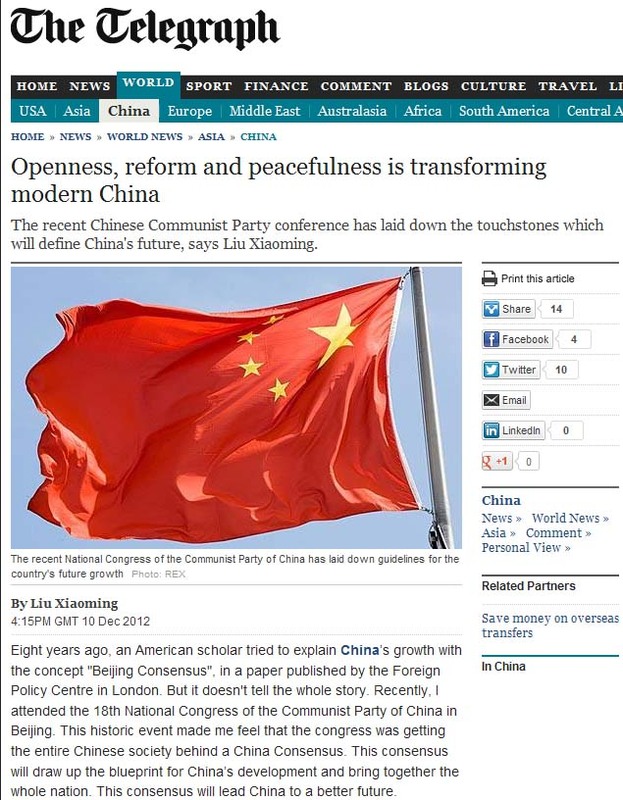 Eight years ago, an American scholar tried to explain China’s growth with the concept "Beijing Consensus", in a paper published by the Foreign Policy Centre in London. But it doesn't tell the whole story. Recently, I attended the 18th National Congress of the Communist Party of China in Beijing. This historic event made me feel that the congress was getting the entire Chinese society behind a China Consensus. This consensus will draw up the blueprint for China’s development and bring together the whole nation. This consensus will lead China to a better future. "China Consensus" runs through Mr Hu Jintao’s report at the congress. There are five key aspects to it. First, scientific development. China is now at a critical juncture. We need to build on the past and plan for the future. We face both opportunities and challenges. What kind of development does China want? How should China achieve it? This is a major subject China needs to think hard about. The answer produced at the congress is as follows. China will continue to focus on economic development. But there is strong stress to secure sustainable development with heavy investment in education and science. A core objective is to improve people’s lives. This will be done by adjusting China’s economic growth model, continuing with political reform, strengthening core values and protecting the environment. What we aim for is not only a prosperous China, but also a beautiful China. This approach that puts people first and stresses comprehensive, holistic, coordinated and sustainable development is what we call a "scientific outlook on development". It is a basic guideline for China’s future development. Second, a policy of reform and opening up. China owes its remarkable growth over the past three decades to such policies. We need to press ahead further, to turn China into a well-off society by 2020 and make China a modern country that is rich, strong, culturally advanced and harmonious by the middle of this century. Moreover, China’s reform will be comprehensive, including both economic and political reforms. Its opening up will be all dimensional. In the coming years, reform will be in the foreground of China’s governance and statecraft. Innovation will be order of the day. Third, stability and harmony. In the past two centuries China lost much time to constant foreign aggression, civil wars and turmoils. It did not concentrate on economic development until the launch of its policies of reform and opening up in 1978. Yet in these roughly 30 years of stability, unmatched changes took place in China. Over 600 million people have been lifted out of poverty. This tells that stability and reform go hand in hand. The 18th Congress symbolised this stability, with China delivering an orderly change of leadership that has become institutionalised. At the same time China aims to uphold social equity and justice through its form of democracy and rule of law particularly to fight against corruption. This will in turn help maintain social stability. Fourth, peaceful development. China wants to see less conflict, more peace, less confrontation, more cooperation, less poverty, more prosperity. China is committed to a path of peaceful and sustainable development. We oppose hegemony in any form. China will not interfere in internal affairs of other countries. We will neither compete with others for dominance nor pose a threat to others. In its opening up, China always seeks win-win situations. We want to contribute our share to strong, sustainable and balanced growth of the world economy through greater cooperation with others. We want friendly cooperation with all countries. We want to build a new type of relationship with developed countries like Britain, the relationship that is long, stable and healthy. Fifth, Chinese characteristics. Every country has its own national realities. In China’s case, it has a history of 5,000 years. It is a socialist country. It has 1.3 billion people. It is also the world’s largest developing country. These are the parameters that define China. They decide that China cannot copycat the social system and experience of other countries. Recent history proves China’s system works well because we have drawn on strengths of others and adapted it to China’s national conditions. As a large country, China must have confidence in its development path, system and theory. In practice, we will further enrich and calibrate them. We want them to bear the hallmark of China and catch the beat of the times. These five points embrace the spirit of the China Consensus, and this was at the core of the deliberations of the 18th congress. The "China Consensus" built at the 18th CPC National Congress holds the key to China’s many successes.